This statement, despite its theistic and metaphysical flavor, was meant to be taken foundationally, not metaphysically. Kronecker was speaking about the idea that if we assume the existence of integers axiomatically, definitions of and theorems about other sorts of numbers can be rigorously provided. For instance, if you assume that integers exist, then you can define a rational number as the quotient of two integers. Speaking of rational numbers, it’s time to brush up on a bit of your old school math. Remember that some rational numbers are finite, when turned into decimal representations. For example, 1/8 is 0.125, a nice, neat, terminating decimal expansion. Some rational numbers will have infinitely many decimal places, but even these will still be well-behaved in one way or another. For example, 2/3 is 0.6666… where the sixes repeat forever. Another well-behaved rational number is 1/7, which is 0.142857142857…, where the ‘142857’ group of digits repeats forever. The subject of this essay’s title — irrational numbers — are not so tidy. They are infinitely long, but don’t behave nicely like rational numbers do — i.e., they don’t terminate or cycle. Pi is a famous irrational number — it just goes on forever, never repeating, and no one can find any pattern within its endless chain of digits. I would like here to posit that, contra the metaphysical interpretation of Kronecker and Hawking, irrational numbers — infinite and infinitely messy numbers — underlie (though, as you’ll see, I think even this is too strong a concept) the fabric of the universe, and that the integers are humanity’s unnaturally well-behaved grand creation. In fact, the universe does not contain anything genuinely integral or numerically tidy. Let’s take the most basic of all integers: The number 1. When you speak about one apple or one table or one person, you are using the number 1 in its most starkly metaphysical role: you are using it to try to perfectly demarcate an object. This is the glory of integers: If we had to talk about 1.1258345257… apples, or pi tables, life would be difficult. And saying we have 1 apple in front of us not only lets us speak more easily about the world, it’s what allows us to talk about the world (and all its objects) at all. “An apple”, “the apple”, “one apple”,… all are ways to say that there is a thing called an apple, and that here’s an example of such a thing in front of us. This apple is perfectly demarcated — it sits completely formed and completely separated from everything else in the universe. Integers, indeed, are epistemologically fundamental, and this is where they get their epistemological primacy from. Without them, we couldn’t understand much about the world. But this doesn’t necessarily make them metaphysically fundamental (foundational, basic) the way Kronecker, et al imply they are. In fact, perfectly demarcated objects simply don’t exist in the physical world. They, and the integers behind them, are human fictions. The world is inherently vague — all of its objects are ill-defined and imperfectly demarcated. We’ve blogged about this in the past, but I’ll recap what I mean by this here. There are objects that are obviously vague — that is, very few would argue that we can be utterly precise about them. Heaps are like this. Nobody thinks that when we say “a heap”, or “the heap”, or “one heap” we are speaking with much precision. A heap of sand, for instance, is still a heap if we take away (or add) a grain of sand from it. The heap is inherently vague and imperfectly demarcated. Of course, you might be aware that this leads to an age-old paradox — the sorites paradox. Recapping our premise: A heap of sand is still a heap of sand if you remove one grain of sand from it. Well, if this is the case, then it’s still a heap if you remove another grain of sand from it. And another. And so on. But soon we will be in the position of saying that we still have a heap of sand even after all of the grains of sand have been removed. Paradox. The problem is that there’s no absolute cutoff point where a heap becomes not a heap. E.g., it’s not like a collection of 500,000 grains of sand is a heap, but 499,999 grains is no longer a heap. If this were the case, then our initial premise would be wrong. In fact, there would be a clear case in which removing one grain of sand would turn it from a heap to a mere collection. So there’s no genuine integral description of a heap. Perfectly demarcating a heap is impossible. But perhaps that’s because heaps are a vague sort of thing in the first place. What about things that generally aren’t considered vague? What about a cat? Well, let’s take my cat, Herbie, who, as I type, is staring at me, wondering when I’ll feed him. What if (as is no doubt true) Herbie has a semi-detached hair on him, on the verge of falling to the floor? Is this hair a part of Herbie or not? If there’s a fact of the matter here, then Herbie is in fact a perfectly well-defined, non-vague object. We all learned in geometry class that world is divided into objects that are 1-dimensional (straight lines and their ilk), 2-dimensional (flat shapes like triangles and circles), or 3-dimensional (things like spheres and cubes). Actually, geometry lied to you, or at least your geometry teacher did. The “world” of geometry isn’t real — it’s a mathematical fiction meant to show us what a perfectly tidy realm would be like. But the real world contains none of these sorts of tidy objects. In fact, there is no such thing as an integral dimension at all, and genuine 1-, 2-, and 3-dimensional objects (things that “exist” in such integral dimensions) are a mathematical myth. A 1-dimensional line segment is a human fabrication — an abstraction. Any line segment you can physically create and/or interact with is bumpy, gappy, and wobbly, bringing it into the second dimension. It also has thickness — if, say, it’s drawn on paper, the ink on the page is raised slightly off of the second dimension, bringing it into the third dimension. Reality is irrational-number based, not integer-based. Perhaps this will be clearer with a brief discussion of the seemingly straightforward question: What if we try to measure the coastline of England? Well, it turns out there is no straightforward answer, thanks to the real world’s irrational messiness. Whatever answer we get, it turns out, depends on the length of whatever ruler we use. 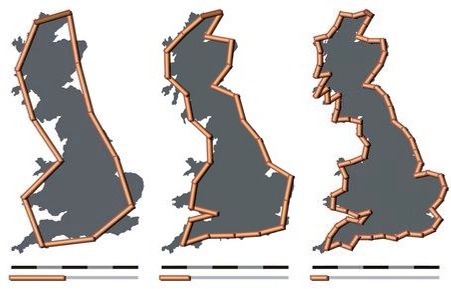 If our coast-measuring ruler is a mile long, when we lay it along the coast, it will cut through parts of England’s interior, wherever the coast is convex, and it will also cut through parts of the ocean, wherever the coast is concave. If we do this around the entire coast, we will get a very rough, rational measurement, that will be wrong (though perhaps useful). Well, we could decrease the size of our ruler in order to get a more precise measurement. Our calculation will be very different for a one inch ruler than for a one mile ruler. Well, it turns out that it’s more correct to think of things like coastlines having what’s called in mathematics a “fractal” dimension — a dimension that’s not an integer. And, yes, that means they are irrational. It turns out that coastlines’ dimensions are somewhere between 2 and 3, depending on the intricacy of the coast in question. We are taught to think of these things abstractly — coastlines are, mathematically, just smooth 2-D curves. But reality isn’t so tidy. Actually, I don’t think that even infinitely messy irrational numbers genuinely underlie the fabric of reality. The idea that anything mathematical is somehow more ontologically foundational than the actual world is simply giving humanity too much credit (and the world too little). Mathematics is, despite what some philosophers believe, a human endeavor, subject to human foibles and error. It is without a doubt incredible, the usefulness of mathematics applied to problems in the real world. We can travel to the moon without (too much) fear of exploding in space; we can pinpoint small objects from great distances; we can create artificial cherry flavorings that (hopefully) won’t kill us. But, in the end, to think that mathematics underlies the natural world is an example of human hubris. It’d be better to say that mathematics describes things about the natural world, but even this could grant mathematics too much. Is it genuinely descriptive to say that the coast of England is of dimension 2.18747636658698…? Or is it just pointing out that our knowledge of this fact is limited, because we can’t plumb the depths of this ugly, non-repeating, infinitely long number? So, really, the title of this post should’ve been “God (or the Big Bang) Created the World; Humanity Tries to Describe it With Irrational Numbers”. But that’s sort of unpoetic.